● Once per turn: You can target 1 face-up card on the field that you can place a Spell Counter on; place 1 Spell Counter on it, and if you do, this card gains 600 ATK until the end of this turn. 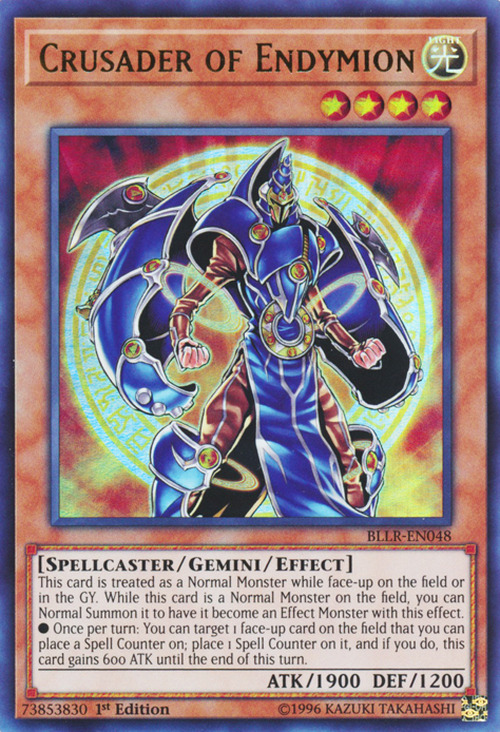 This card, like Endymion, the Master Magician and Magical Citadel of Endymion, are named for the Greek mythological figure of Endymion who was beloved by the moon goddess Selene and put to sleep forever. The effect targets the card you place a Spell Counter on. You cannot place a Spell Counter on this card. If "Skill Drain" is activated, this card loses any ATK gained from its own effect. If a card like "Breaker the Magical Warrior" is having its effect negated, you cannot place a Spell Counter on it with this effect. If the target of this effect is face-down when the effect resolves, no Spell Counter is placed and no ATK is gained. 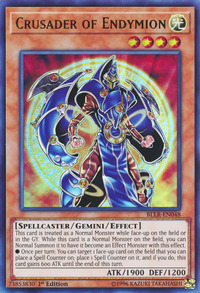 The effect of "Crusader of Endymion" targets one monster on which a Spell Counter may be placed.